Home made marshmallows is not in the agenda of my baking/cooking adventures. 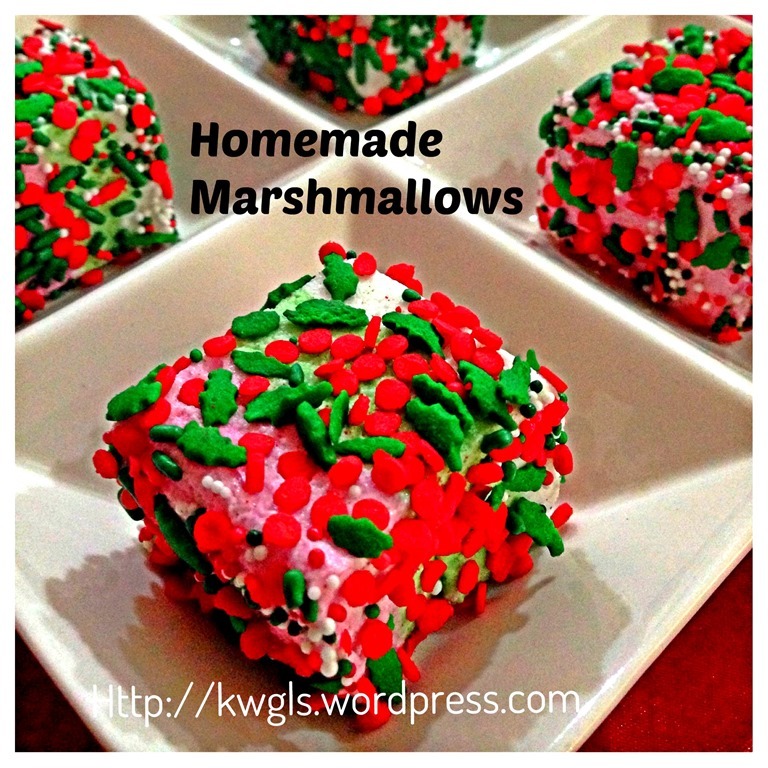 Somehow, when Ms. Mary Ellen Seavey posted her beautiful Marshmallows in my Facebook Group (Food Bloggers and Foodies United), it immediately caught my attention. Her marshmallows looked so attractive and I told her I wanted to prepare these marshmallows. She assured me that this is a tested recipe and encouraged me to try. One hour after I “digested” her post here, I started my trial on making the marshmallow. 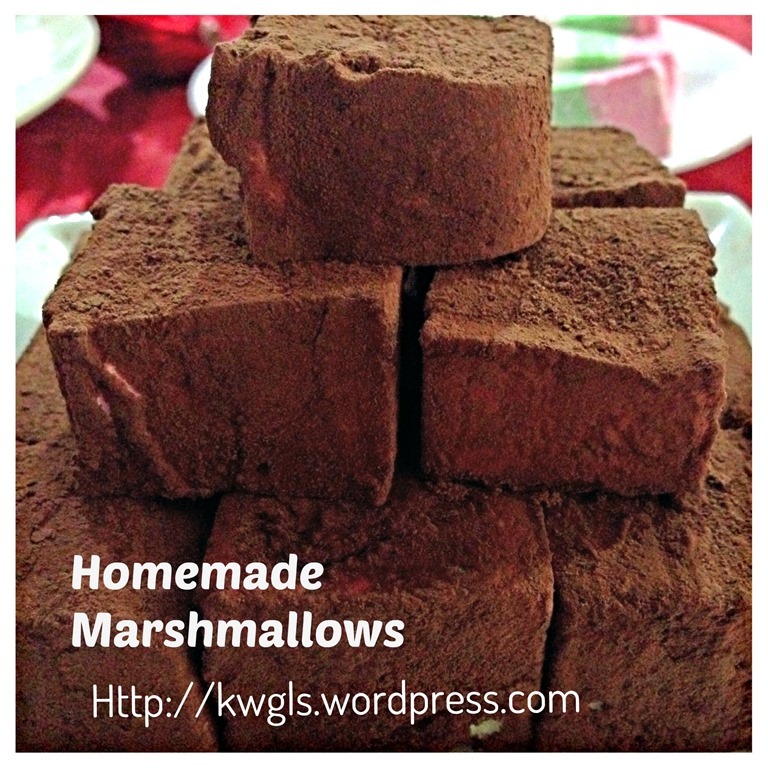 I am happy that on my first attempt, I managed to make my marshmallows. I have slightly modify her recipe by the usage of Pandanus or Screw pine paste. I like the colour and the flavour. For red and white, I have added vanilla flavour to it. It turn out to be a rather nice design. From the above definition, it is rather clear that ingredients of marshmallow preparation are rather simple comprising syrup and gelatine. 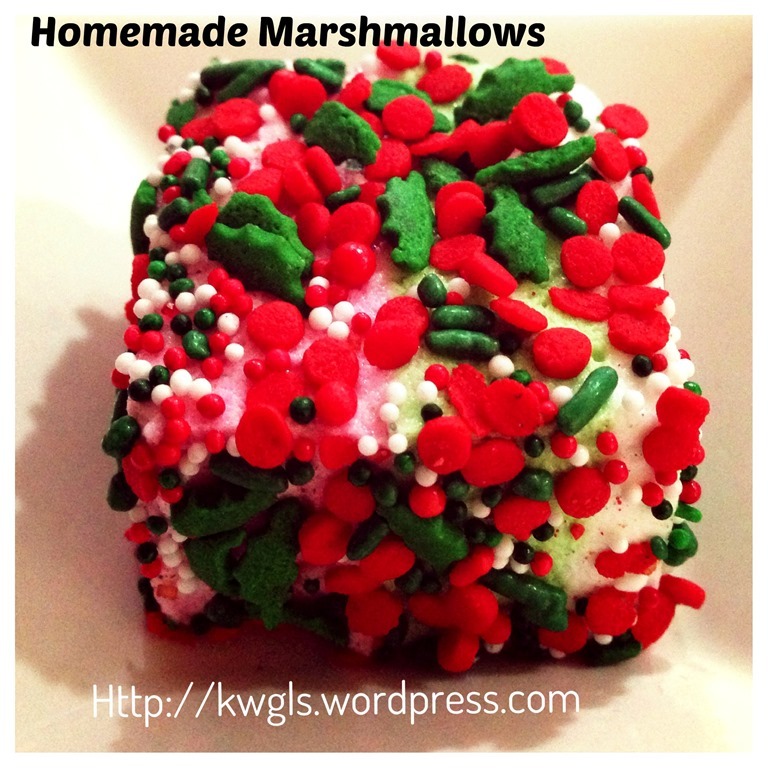 Servings: a 9” x 13” x 1” tray of marshmallows – no. of pieces will depend on how big you cut it. 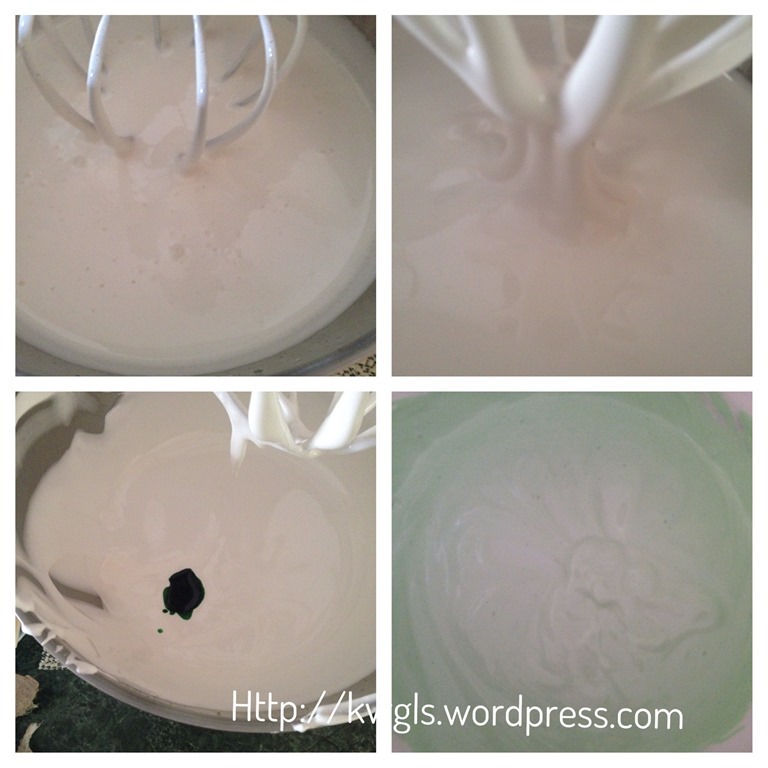 Use one portion of cold water (3/4 cups) and put it in a whisking bowl. 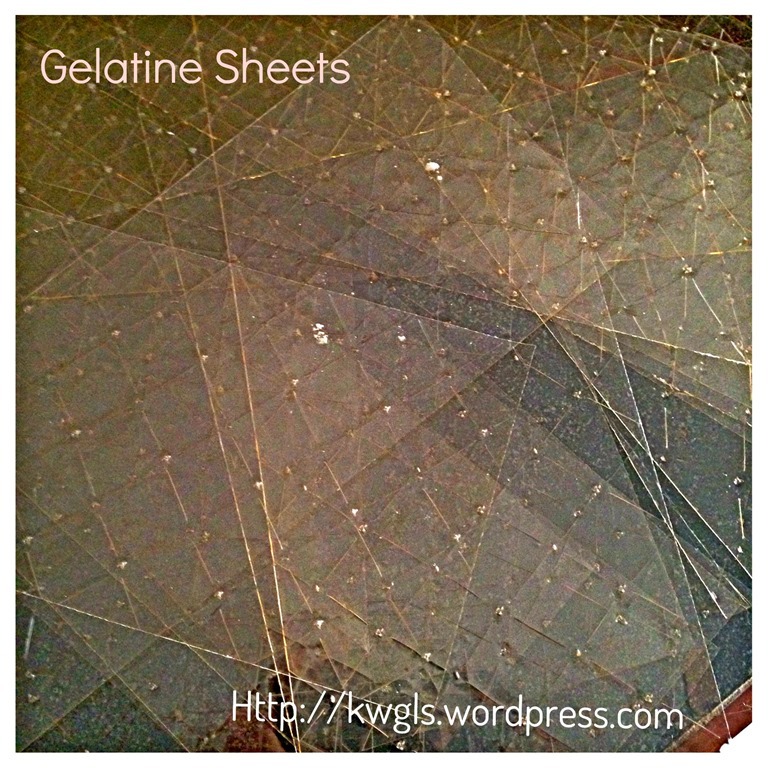 Cut the gelatine sheets into smaller pieces and soaked the sheets/gelatine powder in the cold water. It will gradually soften and slightly expands. Get ready a 9” x 13” baking tray or casserole dish. Place a piece of baking paper with about 2” extra from each side as collar. 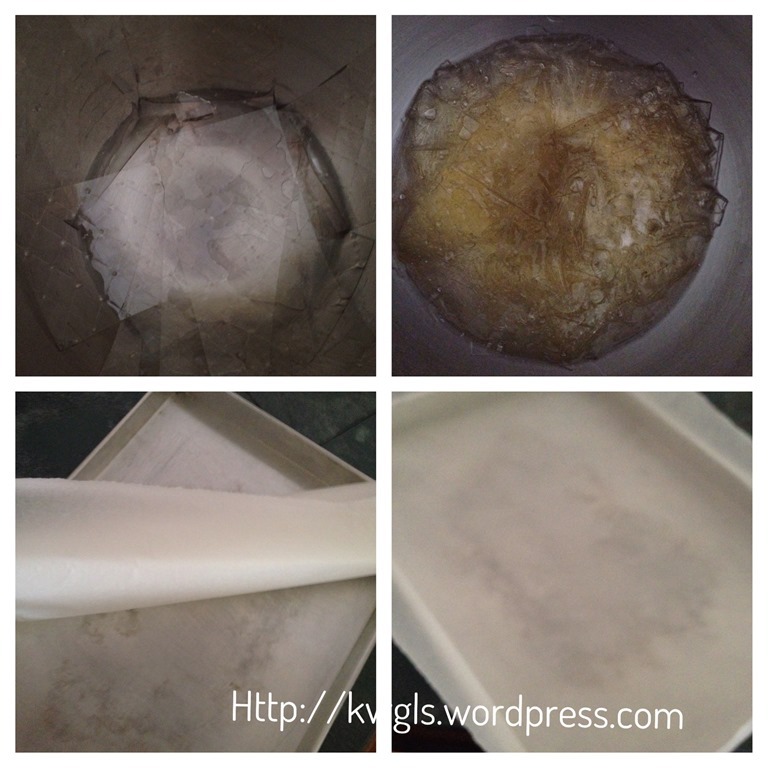 Lightly grease the baking paper with cooking oil or cooking spray. In a sauce pan, put the other 3/4 cups of water. Add golden or light corn syrup, salt and castor sugar. Bring the syrup to boil under medium heat. In between, stir until all the sugar dissolved. Let it simmer without stirring until when an oven thermometer or candy thermometer inserted, it registers a temperature of 115 degree Celsius. 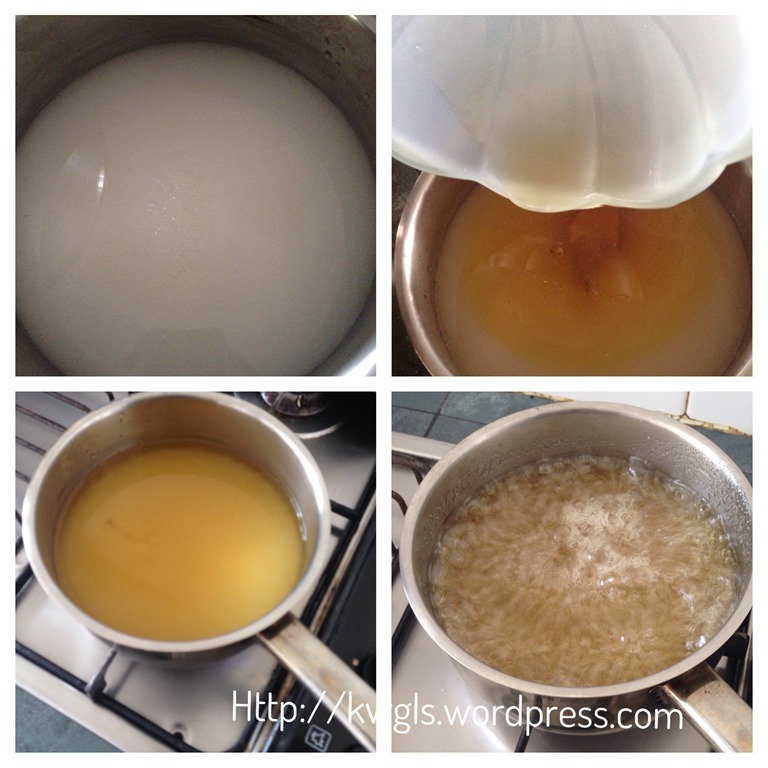 Take the hot syrup from the stove and gradually pour the syrup into the whisking bowl. Start with low speed until all the syrup are added. Once added, gradually increase the speed to high. 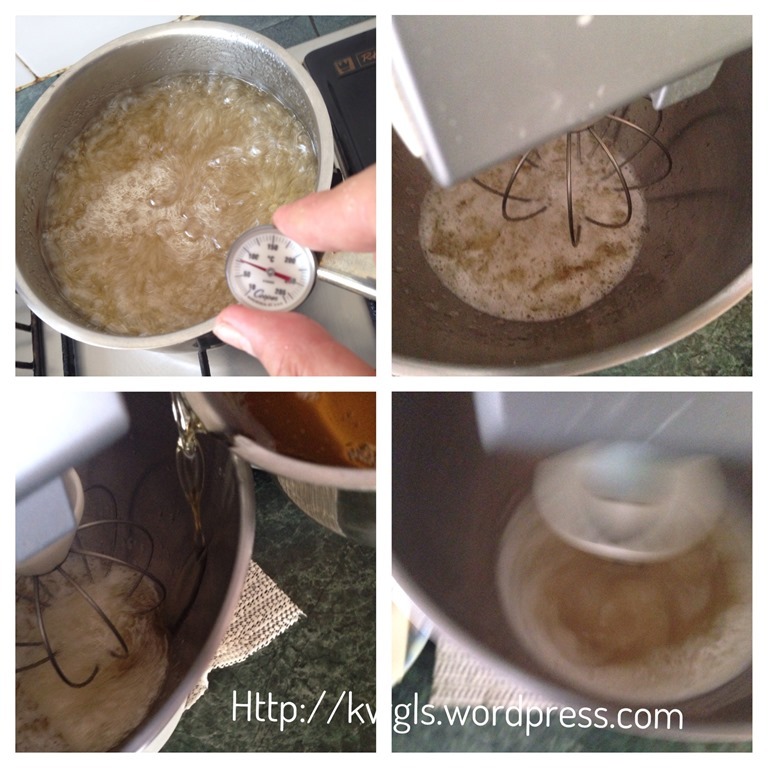 Beat using maximum speed until the syrup is at firm peak. It will take at least about 10 minutes. 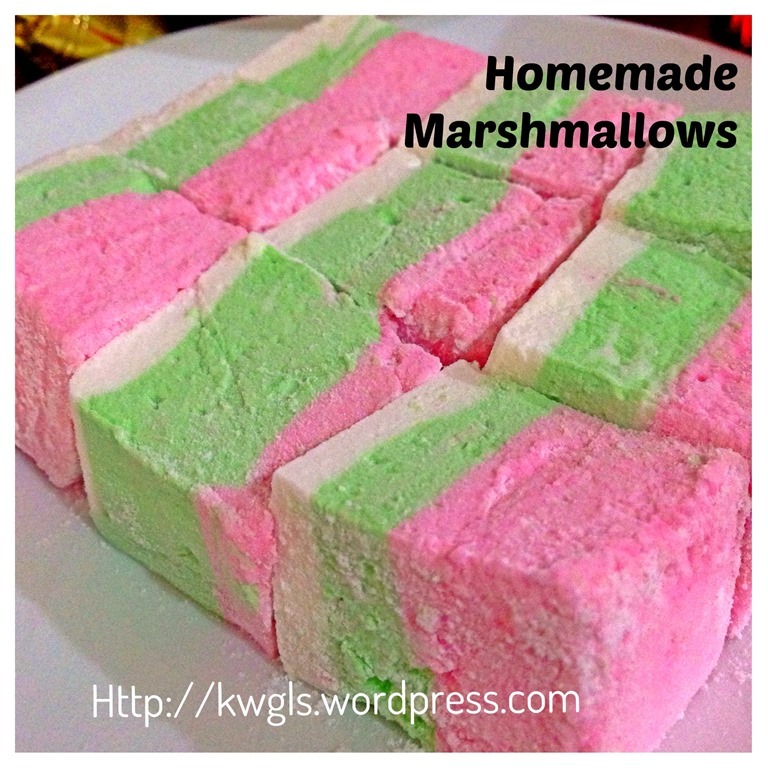 Divide the marshmallows into 3 portion. 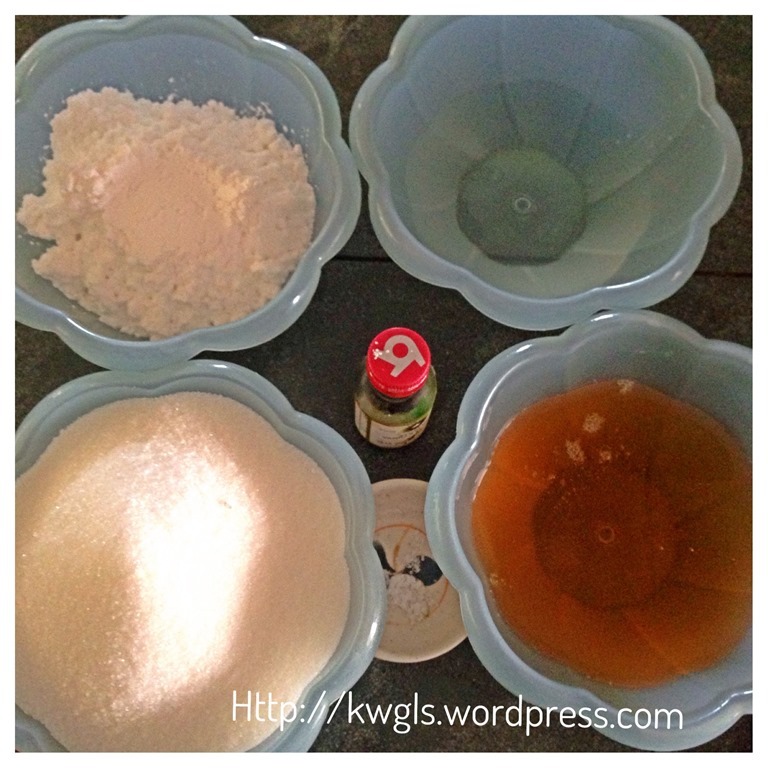 For one portion, add in the Pandanus or screw pine flavouring and for the other 2 portions, add in vanilla essence. 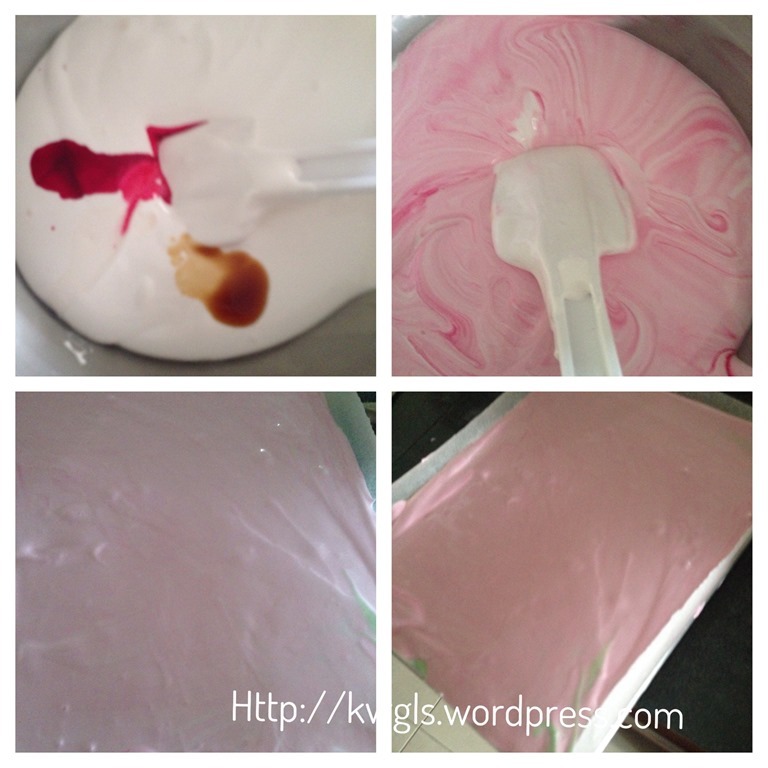 For the 2 portions that have vanilla, add red permitted food colouring to one of the portion. 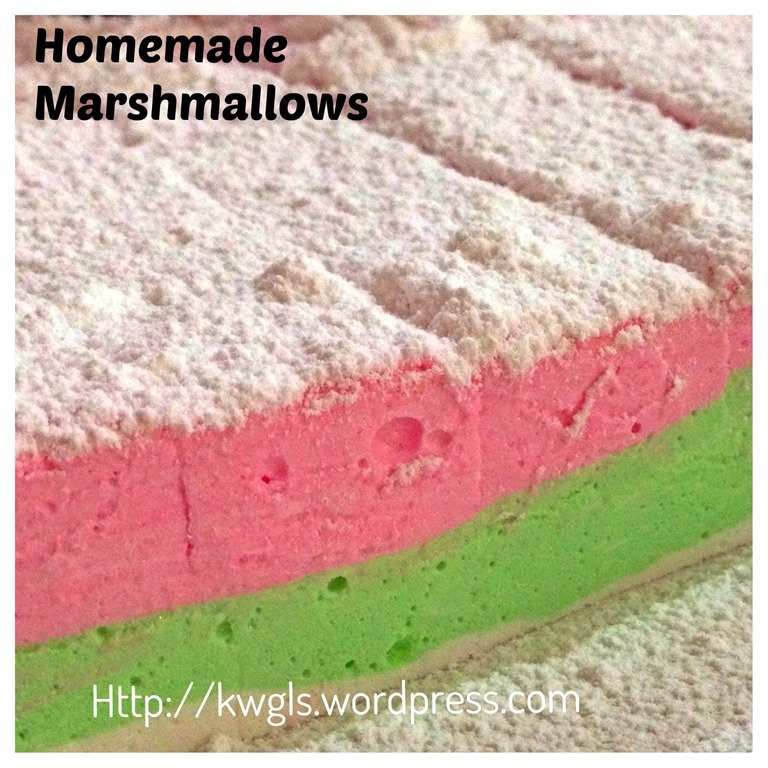 (note that this step is optional if you want it to be original marshmallows). Fill the greased baking tin or casserole in your desired pattern. For me, i have my first layer as white, second layer green and third layer pink. 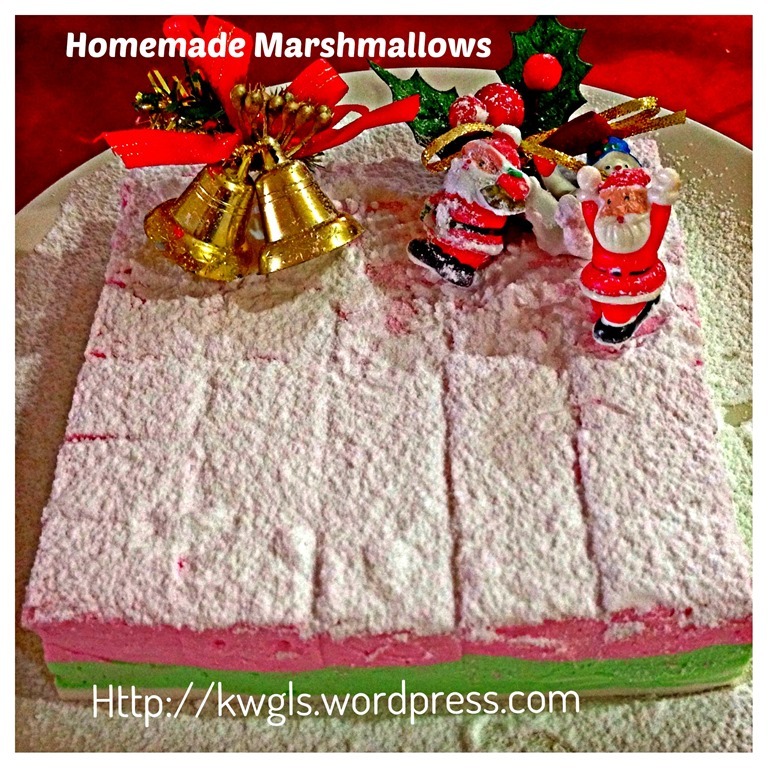 Let the marshmallows rest for at least 3 hours before cutting with a sharp knife. For my case, I noted that overnight resting is easier for cutting. Dust your marshmallow using your prefer ingredients such as icing sugar or cocoa powder or sugar sprinkles. I concurred with Mary that it is almost not possible to use hand whisking as it will require at 10 minutes of continuous whisking. Therefore, to make this, a stand mixer is deemed absolutely. After preparing this, I would think there are a lot of variations. 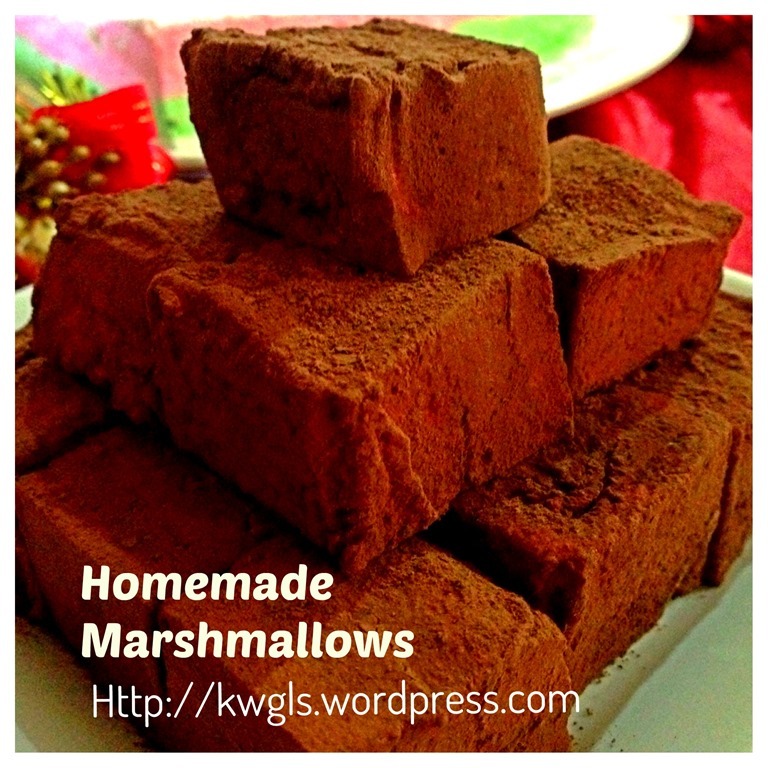 If you have strawberry essence, you can prepare strawberry marshmallows; if you like chocolate marshmallows, may be addition of cocoa emulco is a good alternative. All this while, I seldom eat marshmallow on its own. I like to put it in my breakfast drinks… The sweetness of two pieces of marshmallows is just nice for a cup of breakfast drink. However, if you want to eat it as a sweet, for Asian taste, you can consider reducing 10%-20% of the sugar used and that very much depends on your sugar tolerance level. This is a good and recommendable recipe. 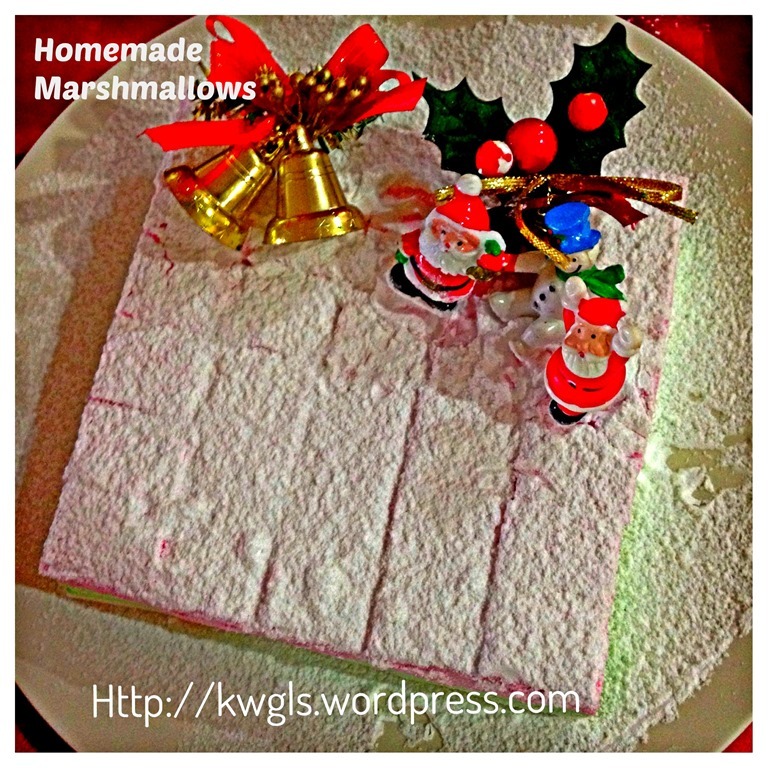 It is nice to have some homemade marshmallows to entertain your guest. 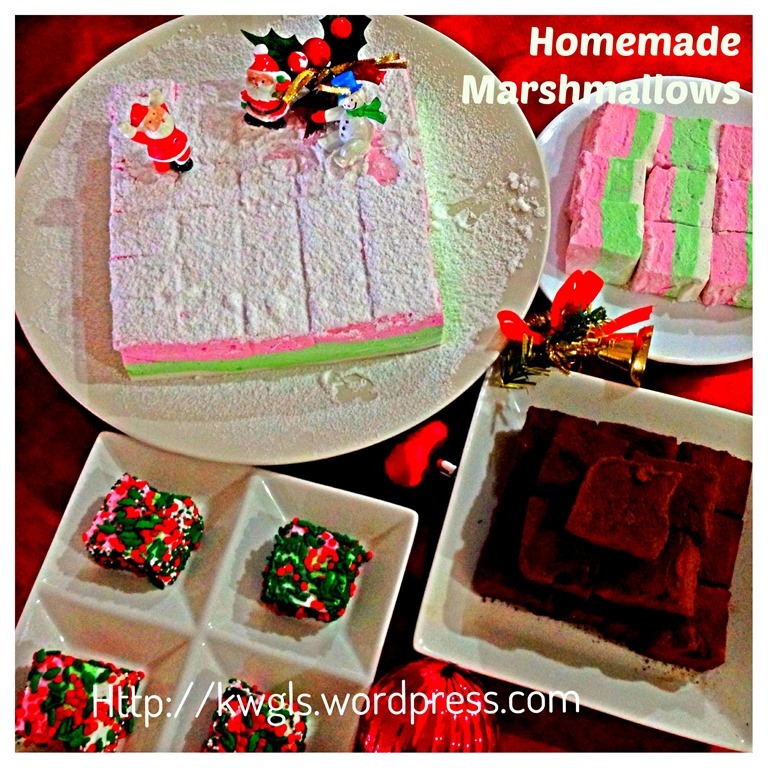 Try making this marshmallow and surprise your guest this coming Christmas or Chinese New Year. Not forgetting to support the original recipe provider, Ms. Mary Ellen Seavay by supporting her Facebook Page or her blog here. Thanks to her generosity in sharing this recipe. 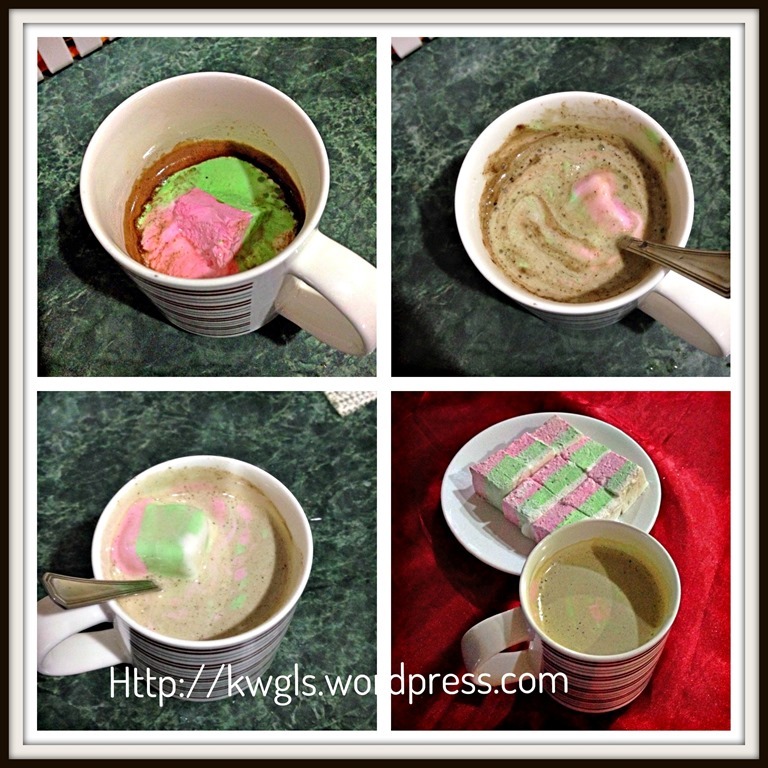 This entry was posted in Christmas 2013, Food Preparation Series, Snacks and tagged 8, GUAI SHU SHU, Guaishushu, Homemade Marshmallows, kenneth goh, postaday. Bookmark the permalink. We were considering this yr whether we shd marshmallows or not. But I decided no, since the sugar content is really high. But still, good job on yr first marshmallow making.. looks good! I’d love to have a few of those pre-made and ready to put under my tree for Christmas morning! hehe looks yummy, Kenneth! Thanks for sharing! I love the idea of making these as a gift. 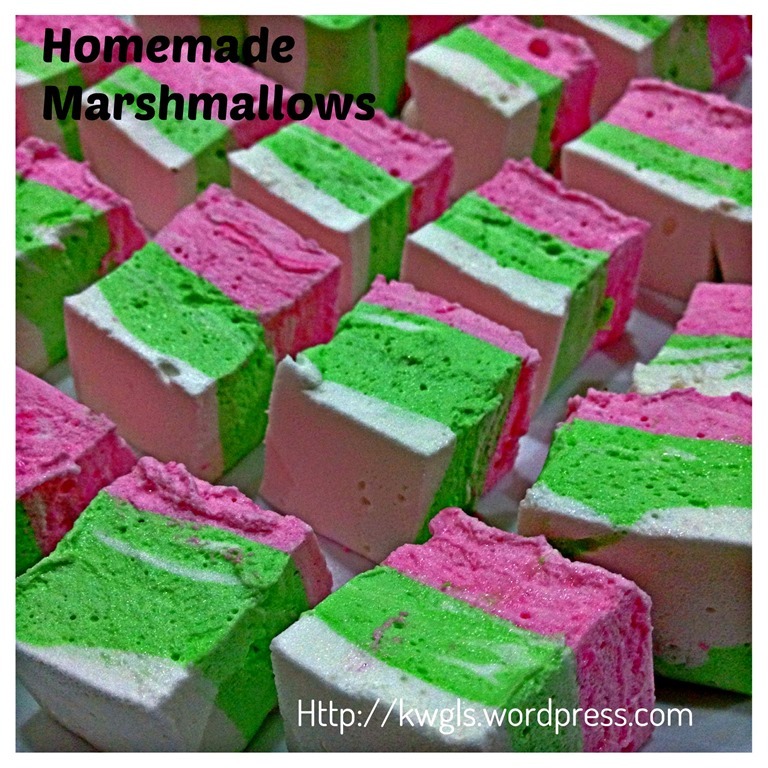 I never would have thought to make my own marshmallows but they are so pretty and I bet delicious, too! I like the background info too. Very interesting to me how many of our “candy” foods started out as medicine. It makes me think of “Mary Poppins” singing about a spoonful of sugar to help the medicine go down. Wow…these look awesome. 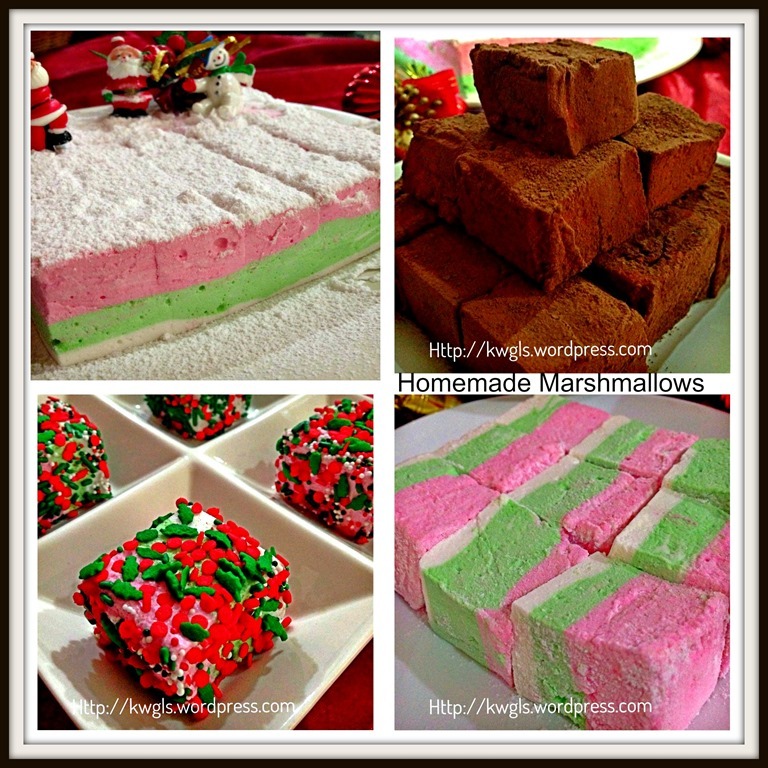 I want to try making my own marshmallows. I know the kids would love it. Very fun! Thanks for sharing on The Four Seasons Blog Hop! Sandra from Scrumptilicious 4 You! This is such a great gift idea ! Thank you so much for sharing them at Tasty Tuesday. I am featuring them this week.